France has raised a pollution alert after an empty Spanish cargo ship split in half on a breakwater near Bayonne on the Atlantic coast. Drifting after its engine failed, the Luno crashed into the breakwater at Anglet, snapping neatly in two, with one half either side of the rocks. 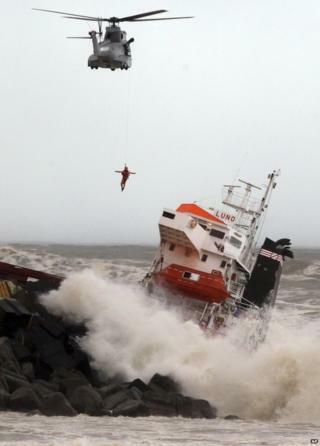 All 12 crew members were winched to safety by helicopter, one at a time. One person suffered a nose injury. As the wreck leaked fuel oil, a maritime pollution alert was declared.